Come join Keep Sevier Beautiful along with hundreds of local businesses to discover new products and innovative ideas! Our bi-annual county-wide litter pick-up. Litter clean up supplies are provided. Simply dress for the weather and come out to help clean Sevier County at any of these nine registration locations! Keep Sevier Beautiful’s annual participation in the Tennessee Environmental Council initiative to help plant 250K trees across the entire state of Tennessee on one day. KSB will serve as a pick up location for ordered trees on Friday February 22nd 2019 at our office location. RecycleMania is a friendly competition for college and university recycling programs to promotae waste reduction activities to their campus communities. 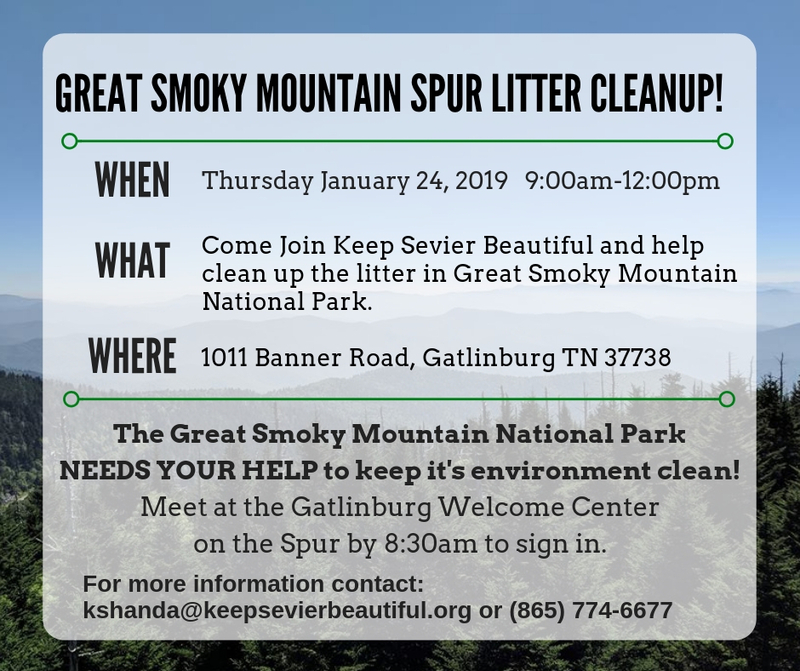 Keep Sevier Beautiful is hosting another cleanup on the Spur in the Great Smoky Mountain National Park! Come out and volunteer to show your support in keeping the environment litter free! Litter pick up supplies will be provided so just come dressed for the weather! Please be sure to park in the upper parking lot to allow visitors parking directly outside the welcome center. Lunch will be provided by Salsarita’s and the first 100 volunteers will receive a free t-shirt from Threds! Come join Keep Sevier Beautiful and volunteer to cleanup the litter along the Spur in the Great Smoky Mountain National Park. We are meeting at the Gatlinburg Welcome Center (1101 Banner Road, Gatlinburg TN 37738) to sign in by 8:30am and then cleanup from 9:00am-12:00pm. We will provide litter pick up supplies such as safety vests, gloves, litter pickers, and trash bags. Come out and help clean up the park in this time of need! Come join us as we celebrate our 5th Annual Wears Valley Fall Fest! What do you get when you take the Smoky Mountains encased in brilliant fall colors, crafters, entertainers, interactive activities, and Keep Sevier Beautiful? A one-of-a-kind Fall Fest that you won’t want to miss! Wears Valley Fall Fest offers three full days of family fun. Families will find traditional elements such as pumpkins, crafts, incredible southern food and of course – entertainment! The Fall Fest will open 10 am - 6 pm Friday & Saturday. On Sunday, the Fest will be open from 10 am - 4 pm. With this being Keep Sevier Beautiful’s largest annual fundraiser, we need all hands on deck from our incredible volunteers! Ready to join the crew? Visit wearsvalleyfallfest.com to sign up today! A fun greener way to swap old Halloween costumes for new-to-you ones! Come volunteer for our Semi-Annual county wide litter clean up; Roads and Rivers Day! Come out and help Keep Sevier Beautiful beautify LIVE-IT Thrift Store! Have fun, win prizes, learn about environmental service, leadership skills, and several other opportunities for teens at Keep Sevier Beautiful! There are multiple wild eagle nests throughout Sevierville that have been highly impacted by discarded fishing equipment. The American Eagle Foundation had to perform several interventions to ensure the safety of eaglets due to the presence of fishing debris in their nest just this year. COME JOIN US TO HELP BY CLEANING UP THE LITTLE PIGEON RIVER! WHAT: Wear close-toed shoes and long pants and dress for the weather! The annual Extreme Household Clean Up is an event hosted by Keep Sevier Beautiful to collect household hazardous waste from residents to be disposed of properly. The 2018 event will be held on Saturday, April 14th at the Sevierville Municipal Parking Lot from 8 am – 1 pm. Come join us for our Spring Roads & Rivers Clean-Up Day! For more information contact Kay Shanda at (865)774-6677 or kshanda@keepsevierbeautiful.org. Keep Sevier Beautiful is selling meal tickets for this year's Wilderness Wildlife Week's Appalachian Homecoming. Friday, May 12th from 5-6:30 p.m. Meal provided by The Old Mill. Advance tickets are $15 or you can purchase at the door for $20. All proceeds benefit Keep Sevier Beautiful and Releaf the Smokies. To purchase a ticket or for more information, contact lbryant@keepsevierbeautiful.org or you can call (865)774-6677. The annual Extreme Household Clean Up is an event hosted by Keep Sevier Beautiful to collect household hazardous waste from residents to be disposed of properly. The 2017 event will be held on Saturday, April 29th at the Sevierville Municipal Parking Lot from 8 am – 1 pm.